A challenging puzzle game from developer Curious Bit, Perfect Slice for iPhone and Perfect Slice HD for iPad are full of fun, colorful mindbenders. The name of the game is precise slicing. 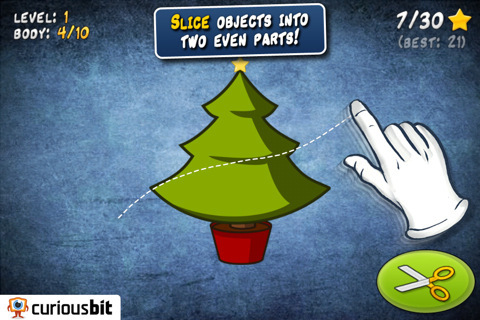 Using your finger to draw a path through an object, the goal is to slice it into two even parts. The closer to 50:50 you get – the “perfect slice” – the higher your score. Symmetrical objects are easy, just split them down the middle, but a bunch of bananas? That’s another story. Unlock achievements, including perfect slice streaks where you make the perfect slice multiple times in a row. 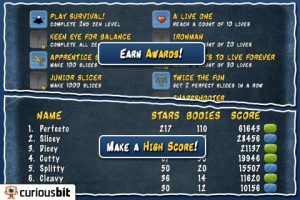 You’re given stars based on your performance, with anything under about 2% rewarding you with 3 stars, while more than 6% from a 50:50 split gives you just 1 star. 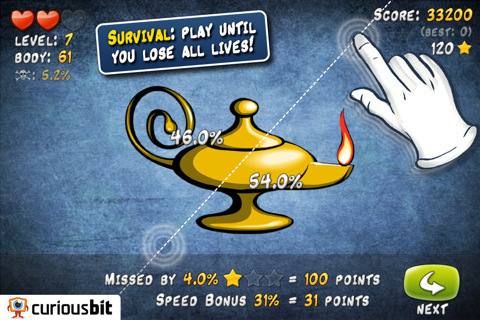 As you make your way through the game, the number of stars required to move on to the next stage increases. After completing the 2nd Zen level you unlock Survival mode. In Survival mode you keep playing until you lose all your lives. Miss your slice by too much and you’ll lose a life, but make the perfect slice and you get another life back. 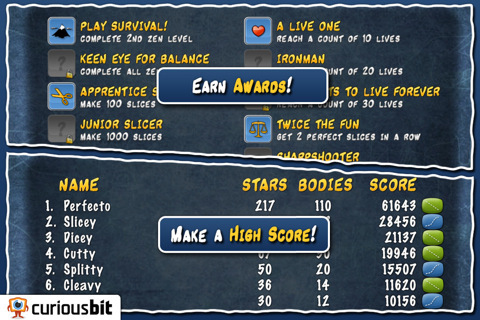 It gets harder and harder as the game goes on, with the necessary accuracy to stay alive continuously increasing. 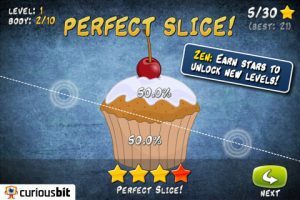 The addictive gameplay of Perfect Slice is complemented by bright and colorful visuals paired with tranquil ambient beats to really get the grey matter into gear. Highly recommended.